A forgotten squash uncovered when I was clearing the sweetcorn stalks, growing beside celery. December 21st. Sunflowers were also planted with the sweetcorn and still flowering November 12th. Also planted amongst the sweetcorn... Lady Godiva squash grown for her seeds, October 9th. Alfie cutting the stalks from the elephant garlic bulbs, August 14th. Onions drying in the sun, August 15th. The Tibet potatoes were great again this year. Angus counted 70 potatoes, good sized, from just one plant! They do make large plants though. Sweetcorn in the background, August 11th. First early potatoes, lady Godiva pumpkin and sweetcorn. It was a good year for all the crops. August 11th. Looking down over the fig tree and the vegetable garden August 11th. Parsnips, kale undercover on the right. Hurst Greenshaft pea plants with recently planted Swiss chard in the near left. July 12th. 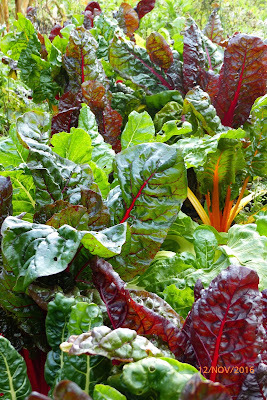 The same Swiss chard bed as previous photo, November 12th. Main crop potatoes with the blueberries netted in the background. July 12th. Our first time with bio-net! The net is to keep the diamond back caterpillars off the kale. It will also prevent cabbage root fly and large and small white butterflies from laying their eggs on the kale. parsnips in the centre. July 12th. The swedes were planted very late, they are direct sown with a handful of compost to mark where they are planted. July 12th. Sweetcorn in the foreground, Potatoes behind, the net in the top left is the cauliflower bed. Alfie came back from the big tunnel with a big grin and 2 yellow cherry tomatoes, one for me! Alfie loves tomatoes... "They are dee..licous!" July 6th. The rest of the family have yet to discover their love for tomatoes! In the foreground, poached eggplant just cleared to make way for overwintering cauliflower. The onions are in the middle bed and behind are the Tibet potatoes. July 6th. Just planted leeks on the left, just weeded peas in the centre and main crop potatoes on the right. 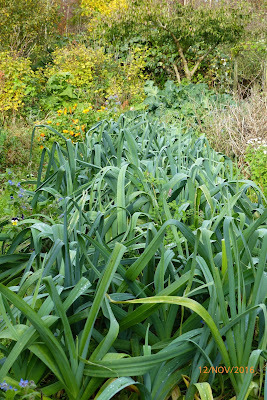 The leek bed on November 12th. Poached eggplant in the veg patch. June 3rd. First early potatoes and Limanthes May 22nd. Peas are growing up between the forget-me-nots and main crop potatoes are just peeking up on the right, May 22nd. May 10th, The same beds from the other end. Recently weeded early potatoes, poached eggplant ground cover on the right. The weeds are left on the ground and magically disappear into the soil within a few days. This is feeding the soil, or more truly, feeding all the creatures that give soil life. This view from the barn used to look out right over the small tunnel, May 10th. Recently planted maincrop potatoes on the right, Peas planted up the middle of the forget-me nots! The yellow flowers that are loved by the bees are purple sprouting broccoli. Recently planted onions, May 10th. The same 3 beds as photo above. Parsnips being sown on the kitchen counter top, April 12th. This works very well as planting out small established plants makes growing parsnips easier to weed, no need to thin the plants, less slug damage.... the cardboard composts into the soil and the young roots have no disturbance when planted out. Alfie says parsnips are "almost too nice" (they make him want more)! Angus forking out some perennial weeds from the vegetable patch. February 24th. The beds are essentially no-dig but when perennial weeds creep into the odd corner we fork them out, a stitch in time saves nine! A frosty morning on January 11th. Frosty vegetable beds and a plastic-less polytunnel! Woodland edge and ponds 2016. Cattle, Sheep, hens... update 2016.